Three air bases have been identified as a potential new home for the Red Arrows air display team, the Ministry of Defence (MoD) has said. They are RAF Leeming in North Yorkshire, RAF Waddington in Lincolnshire and RAF Wittering in Cambridgeshire. 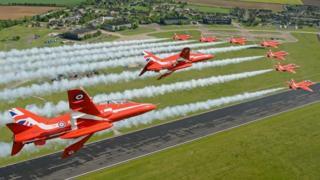 RAF Scampton, the current home of the display team, is to close in 2022 it was announced in July. The MoD is now to carry out detailed suitability studies of the three sites. The Red Arrows' breathtaking airborne stunts with multicoloured vapour trails in distinctive single-engine red jets have become a familiar sight in the summer skies at air shows and military events. The news of "potentially suitable future locations" for the team came in a letter from Tobias Ellwood, the Minister for Defence, to Karen Lee, the Labour MP for Lincoln. RAF Scampton - also home to 617 Squadron as they prepared for the Dambusters mission in World War Two - has housed the Red Arrows since 2000. Six hundred people currently work at the site near Lincoln. The closure of Scampton was announced to Parliament as part of the MOD's plan to sell off about one-third of its estate to make nearly £3bn of savings by 2040.